Whistle Stop train birthday party supplies and favors. All Aboard! Add some excitement and fun to your event with the "Whistle Stop" train theme birthday party line. 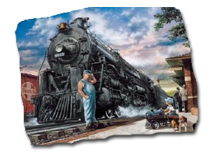 The pattern features a great railroad scene from the gone-bye era of steam engine days, where the little boy with his pedal train engine sits as he plays near the train station and is seen talking to the railroad engineer. Get ready for a steam powered adventure ride! Climb Aboard! Proudly made in USA.